It’s hard to read through a large report or blog post, but adding a table of contents will make it much more manageable. It increases the relevancy of one’s website because users can simply choose to skip through other information to get to the parts they actually need instead of having to scroll through pages after pages of content that do not necessarily apply to them. You may not have the skill level or time to create a table of contents from scratch, so we’ve found the best plugins to create one. The Easy Table of Contents plugin is one of the most popular plugins within this category, with over 2000 current active users and a positive rating of 4.6. It’s popularity is gained from the advanced functionality, which allows greater room for customization without having to go through the trouble of tweaking code to do so. The plugin also helps to automatically generate a comprehensive table of contents based on the WordPress posts, WordPress pages, and custom post types for users by parsing through the website’s contents for headers. Website owners who run on tight budgets should opt for a simple table of contents plugins like the Simple TOC plugin. Upon installation and activation, website owners can rely on the simple TOC plugin to create a Table of Contents for their websites with the help of shortcodes that the developer has incorporated. As there is no limit specified, website owners can create as many tables as they need. The HM Content TOC generates a table of contents catered for specific HTML elements from WordPress posts or page contents, thereby allowing readers to easily select and jump to the corresponding header. All website owners have to do is just take the time to insert the available shortcodes that involve optional attributes. 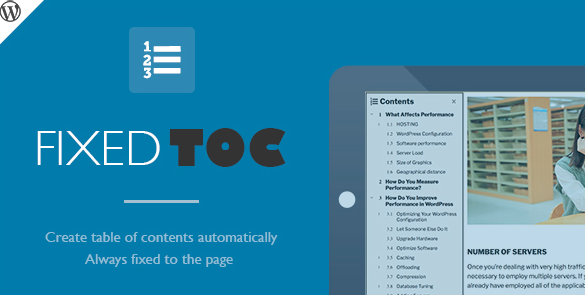 Yet another useful plugin to try out would be the Fixed TOC WordPress plugin. This plugin relies on scanning the headings through the post content and generating a table of contents accordingly, fixing it to the page display. It supports a variety of post types, website owners can simply set their HTML headings and include meta boxes for each WordPress page that can be changed within page settings. This is a paid plugin. Table of Contents Plus helps create specific indexes and tables of contents for long WordPress pages. The tables of content are built from the ground up, including an admin panel where users can decide on the position display, define the minimum amount of headings, choose different appearances, and even insert leads that summarize or introduce the rest of the page. For users with content-oriented websites, this plugin is definitely one of the best available options. If you have more than one page that needs a table of contents, MultiPage Plugin is a great choice. Upon activation, the plugin will automatically create tables based on headers throughout your site. It is easy to customize and free to use. CM Table of Contents is another free plugin that assists website owners in generating table of contents through the defining of HTML tags and class. Users are able to place the table anywhere in the post through shortcode insertions, thereby allowing their readers to have an easier time navigating through the content on their website. Website owners can also make fully customizable and multi-level table of contents, complete with different elements like titles, positions, sidebars, and more. These are some of the best table of contents plugins for WordPress websites. If you are intending to incorporate a table of contents into your website, you should definitely give some of these plugins a try. Experiment with different plugins to see which ones best suit your needs, and which are easier managed. It may take some tries before you are able to find the best plugin that is compatible with your website, but once you are able to implement something that words, you will definitely see results in terms of lower bounce rates and online traffic. Alana Berge is the writer here. She works for Awebstar, as Wordpress Developer Singapore. She helps in developing WordPress Plugins and earn her daily bread from the same. She likes to stay updated with the latest tech advancements and also loves to contribute to the same. For those who are looking to hire WordPress developers that can match pace with the competitiveness can count on Alana for it.